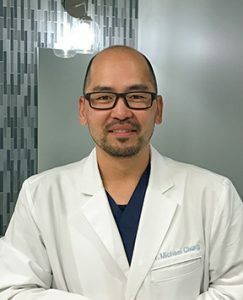 Dr. Michael J. Chung grew up in Bergen County, NJ, and attended high school at the Horace Mann School in Riverdale, NY. He received his Bachelor’s degree from New York University. In 2003, after completing four years of training at Columbia University School of Dental Medicine, he received his Doctor of Dental Surgery degree. The following year, Dr. Chung practiced dentistry as a resident at Columbia University/New York Presbyterian Hospital while completing rotations at Metropolitan Hospital Center, Helen Hayes Hospital and the Thelma C. Davidson Adair Dental Center in New York. He continued his postgraduate studies at the Saint Louis University Department of Orthodontics where he became skilled at multiple orthodontic techniques. He was awarded a specialty certificate in orthodontics and a Master of Science degree after completing his research involving biomechanical friction and third-order torque in self-ligating brackets. His research was published in scientific journals. In 2007, Dr. Chung took over the practice of Dr. Martin Weinstein in his Freehold and Manalapan locations. He moved the Freehold practice into a new state-of-the-art office on Iron Bridge Road in 2012. Dr. Chung is a PROPEL Orthodontics provider, and was the first orthodontist in western Monmouth County to offer this groundbreaking procedure to reduce treatment time. He is also an Invisalign® Preferred Provider, and has been selected as a Top Dentist by the Consumers’ Research Council of America six years in a row. He has also been selected as a Top Dentist in Monmouth Health & Life magazine, one of New Jersey’s Favorite Kids’ Docs by NJ Family magazine, and one of the Top Orthodontists in the industry by Orthodontic Products magazine. Dr. Chung has served as both an assistant clinical dental instructor at Columbia University School of Dental Medicine, and a preclinical orthodontics instructor at the Southern Illinois University School of Dental Medicine. His professional affiliations include the American Association of Orthodontists, Middle Atlantic Society of Orthodontists, New Jersey Association of Orthodontists, American Dental Association, New Jersey Dental Association, Monmouth-Ocean Dental Society, and the Orthodontic Education and Research Foundation. Dr. Chung lives with his wife and two children in Manalapan. In his free time, he loves playing both lacrosse and golf, fishing, snowboarding, scuba diving, and rooting for the Jets, Yankees, and Knicks. Dr. Chung is a US Lacrosse certified coach in the Manalapan Youth Lacrosse Club.